Want to know more about The Florida Center? We would be happy to present to your organization. The following Q&As are based on substantial related research. Many more details are available. 1. Do most state capitals have a Performing Arts Center? Yes: North and South Dakota, Alaska and Florida do not. 2. Are there cities in Florida similar in size to Tallahassee/Leon that have Performing Arts Centers? Yes, including Sanford, Bradenton, Gainesville, Hollywood, and Melbourne. 3. Do many USA cities similar to Tallahassee/Leon have Performing Arts Centers? Yes, including Paducah (25,000 population / 169,000 in adjacent counties), Madison Wisconsin ( 330,000 urban population), Durham, N.C., South Bend, Indiana, Virginia Beach, VA, Green Bay, Wisconsin and many, many more. 4. Is there evidence that any Performing Arts Centers failed financially during the Great Recession? No, none that I could find. Intelligent programming producing needed revenues plus civic pride and citizen loyalty seems to sustain Performing Arts Centers across the United States. 5. Is there a general awareness of the many opportunities a Performing Arts Center can deliver? No. Not many people are aware of what a Performing Arts Center can produce for a city and county. Research findings tell a surprisingly positive story. If this story can be relayed effectively to citizens, it is quite possible and likely that a majority of citizens will be impressed and supportive of having a Performing Arts Center in Tallahassee. 6. Will Tallahassee’s economy be better when a 1 Penny sales-tax referendum is held? Yes, according to most current economic projections. By the time the 1 Penny referendum occurs (by 2016 or later? ), it is very likely that Florida and Tallahassee/Leon’s economy will be in a much higher growth period than now. After a significant community education effort and with more positive economic impacts on businesses and families, citizen support for the referendum, including the CPA, could be sizable. 7. Do most local governments support the construction of their Performing Arts Center? Yes. The latest to do so is Greensboro, North Carolina where the City Council recently budgeted $ 20 million as their share of a public-private partnership to build the Greensboro Performing Arts Center. Individuals, businesses and other groups now know that the Performing Arts Center will be a reality if they collectively do their part. Citizen (e.g. cash and estate distributions) and business contributions are now much more likely because the City verified its commitment. In addition, the budgeting of public funds can generate public-private business financing relationships that can likely guarantee a successful Performing Arts Center. 8. Do local governments typically support their Performing Arts Center’s operating budgets? Yes. Studies indicate governments budget an average of 12% of operational funding requirements. There is substantial documentation that government on-going support can be reduced as CPAs get established, more private revenues streams become available and current revenue sources increase with the programming of high quality performances and events. 9. Is there a logical reason for government to support a Performing Arts Center? Yes. Substantial evidence and documentation clearly shows that in downtowns similar to Tallahassee there is significant new and expanded private business investments after a city announces intentions to build a Performing Arts Center. This results in growth in downtown property purchases (for residential and commercial uses), continually increasing property values and continually increasing collections of property taxes for the city, county and school district. In addition, sales taxes, bed taxes, occupational licenses, permit fees, rental car fees, filing fees and other governmental revenues are produced because a CPA is built and then operated. If Tallahassee/Leon invests $ 30 million towards the Performing Arts Center’s construction ( $ 52 million total cost estimate) and about $ 650,000 a year (about 12% of the total) to help cover operating costs, it is likely that within 15 years those contributions will more than be replaced with the above mentioned tax and fee collections. Every year thereafter, it is likely that all local governments and the state government will receive large “returns” on those investments to use in support of other public needs in the future. Potentially, the combination of property and the other tax and fee collections could produce millions of dollars a year above and beyond the original investments. This is a major reason why Performing Arts Centers do not fail. 10. Will a Performing Arts Center likely produce millions in new business sales, hundreds of new jobs, millions in income for citizens, and millions in government revenues…every year? Yes. 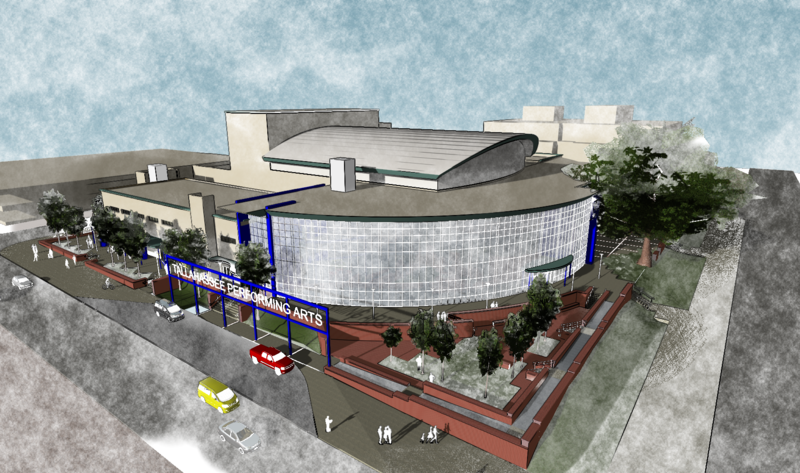 The announcement of a Performing Arts Center likely will stimulate the beginning of many years of business investments. The anticipation of very large numbers of people from outside as well as inside the county coming to downtown Tallahassee will drive it. A Performing Arts Center the size proposed for Tallahassee typically schedules 300 – 400 events a year, at least. By the time the Tallahassee Performing Arts Center is built, Leon and adjacent counties will be about the size of current day Madison, Wisconsin and its four adjacent counties. Madison’s Overture Center (7 venues from 200 – 2,200 seats) produced a documented economic impact (business sales) of $ 38 million in 2011. The projection for the new Greensboro Center (1 venue/1,800 seats) is about $ 13 million. These are sales to out-of-county visitors. A major “Arts Study” documented typical spending by visitors to Performing Arts Centers from outside the local draw area. Thirty-three (33) percent is for performance/event tickets, 25% for meals and refreshments, 17% for lodging, 12 % for souvenirs, 8 % for parking/transportation, 4 % for gifts/retail and 1 % for child care. In addition to out-of-county visitors, the Performing Arts Center itself and all out-of-town performers and event support teams will spend money while in Tallahassee. Gainesville’s Performing Arts Center documented over 1,500 room nights are booked annually. Investors and developers calculate market opportunities that come with the above numbers. Madison’s downtown was predominately government buildings until they announced plans to build The Overture Center. Immediately, the private investments in downtown properties began many years of escalation. Virginia Beach experienced the same phenomenon. It is likely that most, if not all Performing Arts Centers throughout the USA, experienced similar investment patterns. The millions more in “net” new sales, due to a Performing Arts Center, results in businesses creating many more jobs. Madison’s economic studies document the creation of 238 full time equivalent jobs (some part time, some full time) in 2010. Paducah documented the creation of 241 jobs in 2012. Greensboro expects 268 jobs to be created. Mid-town Tallahassee shows how a few “leading” investments can attract many people to an area and consequently, more investments. The Gaines Street project, College Town and FSU planned investments will have similar effects. Imagine the additional impact of a Performing Arts Center & Education that draws many more thousands to downtown Tallahassee. 11. Is Tallahassee able to support a successful Performing Arts Center? Yes. In fact, Tallahassee’s economic base, personal income levels, demographic profile, social environment and educational levels are as good or better than almost all comparable cities with a Performing Arts Center. Why would anyone think that Tallahassee is not as capable as so many other cities? 12. Is the proposed Performing Arts Center a unique facility for Tallahassee? Yes. It’s size (1,700 seats) makes possible the ability to attract very popular international and national performers and events that, otherwise, likely would not appear in Tallahassee. Plus the design and attractiveness of the facility is likely to be a magnet for internationally and nationally popular musicals, dance groups, vocal artists and Broadway performances, as well as local performing groups and individuals, public school and university performances, community events, business, non-profit group and citizen gatherings, family weddings and reunions and neighborhood and civic group gatherings. These events and proud Tallahassee individual and business contributors can produce revenue streams that can limit or eliminate public funding, eventually. 13. Is including the Performing Arts Center on the 1 Penny Sales Tax list sensible? Yes. It sends a strong message to potential private investors (citizens and businesses). They will know that a Performing Arts Center is a distinct possibility if there is government support because without it, a proposed Performing Arts Center is unlikely to find 100% private funding. Knowing this, a public-private partnership is definitely a way to build and operate a Tallahassee Performing Arts Center. The 1 Penny sales tax referendum may be 3 or more years away. It is certainly possible that community education efforts plus support building in the community and a more optimistic economy can result in its passage, comfortably. There is sufficient time for the Tallahassee/Leon County to become comfortable with final numbers, concerning a Performing Arts Center, see private “match” money accumulate and isolate serious business support that can assure the construction and operation of a beautiful and functional Tallahassee Center for Performing Arts and Education. It seems prudent to give the CPA a chance to do wonderful things for Tallahassee.